We believe that our primary task is to gather each Lord's Day under the headship of Christ for the preaching and reading of the scriptures, prayers of supplication and thanksgiving, for the observance of the ordinances of the Lord's Supper and Baptism, and for the mutual consideration of one another in order to stir up love and good works, all for the glory of Christ and the strengthening and maturing of His church. ​We believe that Jesus Christ is present and active in His church, meeting with us in our worship and speaking to us through His word. So we reverently listen to Him speak to us through the reading, preaching, and teaching of His word. ​We sing songs of praise to our God and Savior. We seek His face through sincere and fervent prayer. We reverently listen to Him speak to us through the reading, preaching, and teaching of His word. All of our faith and practice is built upon the conviction that our God is a God who speaks, explaining and interpreting His world to us. 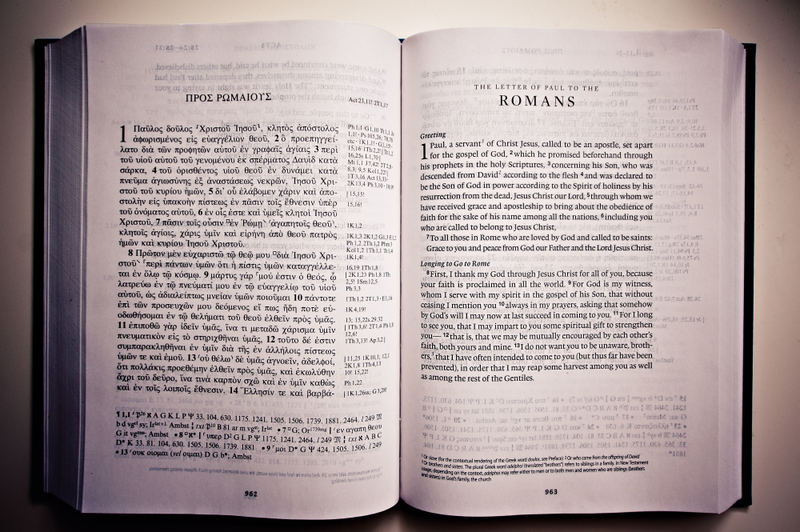 God's infallible interpretation of the world is recorded for us in the Old and New Testaments. And God continues to speak to us by His Spirit through His Word. Therefore, since we believe that the Holy Scriptures are our only rule of faith and obedience, we endeavor to make that Word central to all aspects of our faith, practice, and worship. The Word of God is living and active, sharper than any two edged sword, piercing to the division of soul and of spirit, of joints and of marrow, and discerning the thoughts and intentions of the heart. (Hebrews 4:12). Christ Reformed Baptist Church is a confessional church, seeking to corporately confess truths that unite us in doctrinal affirmation. The fullest expression of what we believe the Bible teaches is found in the historic London Baptist Confession of Faith of 1689. It is a confession in line with the orthodox teaching of the Church throughout the history of the Church. “This ancient document is the most excellent epitome of the things most surely believed among us. It is not issued as an authoritative rule or code of faith, whereby you may be fettered, but as a means of edification in righteousness. It is an excellent, though not inspired, expression of the teaching of those Holy Scriptures by which all confessions are to be measured. We hold to the humbling truths of God's sovereign grace in the salvation of lost sinners. Salvation is through Christ alone and by faith alone." The Scriptures of the Old and New Testaments were given by inspiration of God. They are the infallible, authoritative, and all-sufficient rule of all saving knowledge, faith, and obedience. All Scripture is (in its original autographs) the very Word of God, and it is therefore without error and utterly reliable with regard to fact and teaching. It has been graciously preserved with particular care and providence for our benefit today. The Scriptures are to be neither added to nor subtracted from. God created all things from nothing. Adam and Eve were the first humans; they were created by God after His own image in perfect righteousness. The account of creation in Genesis 1 and 2 is historical, not mystical; hense evolution is a theory contrary to a scriptural understanding of creation. God from eternity decreed all things that come to pass, and He perpetually governs all creatures and events. We affirm the absolute sovereignty of God. However, God is in no way the author or approver of sin, nor does His sovereignty in any way diminish or violate the responsiblity of men. Our first parents, Adam and Eve, by their disobedience, lost the righteousness in which they were created and became corrupt. The guilt of Adam's first sin is imputed to all men, who, being his descendants, are born in a sinful state and condition called original sin. From this corrupt nature, all transgressions proceed because all men are wholly inclined to all evil continually and are opposed to all that is spiritually good in the sight of God. This is often referred to as man's total depravity. Thus while man is unable of himself to repent of sin and believe on the Lord Jesus Christ as Savior and Lord, he is completely responsible to do so. This is by no means to deny that a vast amount of virtue prevails through the common grace of God; yet man is unregenerate and essentially alienated from his Creator. Jesus Christ, the only begotten Son of God, is the divinely appointed Mediator between God and man. Having taken to Himself a human nature, while maintaining His sinlessness, He perfectly fulfilled the law, suffered, and died upon the cross for the salvation of sinners. He was buried, rose again the third day, and ascended to the Father, at whose right hand He ever lives to make intercession for His people. He is the only Mediator, Prophet, Priest, and King of the Church, and the Sovereign and Lord of the universe. Election is God's eternal choice of some persons to eternal life - not because of foreseen merit or faith in them, but because of His mercy in Christ. Those who have been predestined to be saved are in due time called, justified, sanctified, and glorified. By His Holy Spirit and through His Word, God calls us into fellowship with His Son Jesus Christ. By this divine work, He enlightens our minds, recreates us in and to newness of life, and renews our wills and affections by the Holy Spirit. Repentance is a saving grace. The repentant person is convicted of the evil of his sin by the Holy Spirit. Repentance involves a humbling of oneself, self-abhorrence, exhibition of godly sorrow for and hatred of sin, and a purpose to walk before God so as to please Him in all things. Repentance is to continue through the whole course of the believer's life. Faith is a saving grace. By faith, we receive and rest upon Jesus Christ alone for salvation as He is freely offered to us in the gospel. Faith is also a grace by which we believe the Word of God to be true and seek to apply its teachings to ourselves. Justification is an act of God's free grace whereby He pardons our sins and accounts us righteous in His sight. Justification is based not on anything we have done but only on Christ's righteousness as imputed to us and received by faith alone. Thus justification is a declarative and forensic act of imputed righteouness, not a process wherein we acquire righteousness before God due to our own sanctification. Justification is by faith in Christ's work alone, not faith in Christ's work plus something the believer does. By no means is justification conferred in baptism. For the sake of His only Son, Jesus Christ, God has been pleased to make all justified persons sharers in the grace of adoption. Adoption is the means by which believers are numbered with, and enjoy the liberties and privileges of, the children of God. Those who are united to Jesus Christ are, by regeneration, renewed in their whole nature after the image of God, and are set apart by God to share in His holiness. This is definitive sanctification. Because of the remaining effects of the former corrupt nature, there is also a progressive aspect to sanctification whereby the Holy Spirit, by virtue of indwelling the believer, promotes true holiness of life. Sin's power over the believer is broken, the evil desires to which sin gives birth are increasingly weakened, and the Christian more and more lives according to the Word of God. This is holiness without which no man will see the Lord. Those whom God has accepted in the Beloved, effectually called and sanctified by His Spirit, and to whom He has given the precious faith of His elect, can neither totally nor finally fall from the state of grace. On the contrary, they will certainly persevere in the state of grace to the end of their lives and thus be eternally saved. This outcome is certain because God will never repent of having called them and made gifts to them. Furthermore, God continues to work in His chosen ones faith, repentance, love, joy, hope, and all the graces of the Holy Spirit that lead to immortality. Many storms and floods may arise and beat against the elect, but they will never be removed from the foundation and rock that they stand upon by faith. Nevertheless, through unbelief, temptations, allurements of the world, and indwelling sin, the sight of God's love may be temporarily hidden from them and they may fall into dreadful sins. God, however, is still the same and they shall surely be kept by the power of God unto salvation. They will enjoy their purchased possession, because they have been engraved upon the palm of His hand, and because their names have been written in the Book of Life from all eternity. The Lord Jesus Christ is the Head of the Church, which is composed of God's elect in every age. According to His commandment, Christians are to gather in local churches. To each local church He has given authority and responsibility for administering order, discipline, and worship. The officers of a church are elders and deacons. The church administers the public means of grace, which is the spiritual food that God has provided whereby Christians mature. The means of grace whereby Christ communicates to us the benefits of redemption are His ordinances, especially the proclamation and explanation of the Word of God, the administration of baptism and the Lord's Supper, and prayer. Baptism is an ordinance of Jesus Christ obligatory for every believer. The proper mode of baptism is by immersion in water in the name of the Father, the Son, and the Holy Spirit. It is a symbol of the believer's union with Christ in His death, burial, and resurrection. It signifies the washing away of sins and is a prerequisite to church membership. The Lord's Supper is an ordinance of Jesus Christ and is to be observed by His church until He returns. It is to be administred with the elements of bread and the fruit of the vine. It is in no sense a re-sacrifice of Christ. Its purpose is to commemorate Christ's death, confirm the everlasting covenant in Christ's blood, and strengthen union with Christ in His love as well as union and communion with other believers. Unforgiveness between members and unconfessed sin should be dealt with before coming to the Lord's table. It is the duty of every church and every Christian to extend the gospel to all men everywhere. As faith comes by hearing the Word of God, we are to seek by all methods sanctioned in Scripture to persuade men to seek Jeus Christ and His salvation. God has commanded us to love him with all our heart, soul, mind, and strength and to love our neighbors as ourselves. This is the summary of God's Law (Luke 10:25-27). The Ten Commandments (as given to Moses inEx. 20:1-21) especially articulate the moral law of God. This moral law, which is expressed in the precepts of Scripture as a whole, provides the Christian with a guide for life. We affirm the perpetuity of the moral law, including the continuing validity of the Fourth Commandment. A man is not justified by the works of the Law, but only through faith in Christ Jesus (Ga. 2:16); even so, we reject antinomianism or any other teaching which claims that God's moral laws are not binding upon believers today (Matt. 5:17-19). The Old Testament ceremonial laws, having been fulfilled in Jesus Christ, do not bind the consciences of believers today. Principles embodied in Old Testament civil laws are timeless, but their specific applications were to the covenanted nation of Israel. The light of nature shows that there is a God, who has lordship and sovereignty over all; is just, good and does good unto all; and is therefore to be feared, loved, praised, called upon, trusted in, and served, with all the heart and all the soul, and with all one's might. However, the acceptable way of worshipping the true God is instituted by Himself and so limited by His own revealed will that He may not be worshipped according to the imaginations and devices of men, nor the suggestions of Satan, under any visible representations, or any other way not prescribed in the Holy Scriptures. Civil government is ordained of God. It is the duty of Christians to obey those who have rule over them in all matters consistent with the teaching of Scripture. Christians are also to pray for their rulers. The bodies of men after death return to dust but their spirits return immediately to God - the righteous to rest with Him, the wicked to be reserved under darkness until the judgment. The bodies of all the dead, both just and unjust, will be raised. God has appointed a day in which He will judge the world by Jesus Christ, when everyone shall receive according to his deed. The wicked will go into everlasting punishment in Hell with the devil and his angels. The righteous, with glorified bodies, will live and reign with Christ forever.